It took a while, but space physicists who predict immense balls of solar debris smashing into Earth have finally caught up with their brethren who forecast terrestrial weather. Rather than simply relying on rules of thumb, space weather forecasters have begun running a computer model that actually simulates the development of conditions between the sun and Earth. They’re following the lead of atmospheric weather forecasters, who have been using computer models since the 1960s. Warnings of when solar storms will strike Earth are already much improved. The better the warning of major solar storms, the better earthlings can prepare for the consequences, which can include electrically fried satellites, degraded GPS navigation, and widespread blackouts. The culprit is a magnetic bubble of tens of millions of tons of protons and the like blown off the sun at several million kilometers per hour. It might seem easy enough to keep track of something that big, but observation platforms between the sun and Earth are few and far between. And the choppy sea of magnetic fields and charged particles that the ejected bubbles plow through can slow and deflect the bubbles. Drawing on the typical behavior of previous bubbles, called coronal mass ejections (CMEs), forecasters at the National Oceanic and Atmospheric Administration’s Space Weather Prediction Center (SWPC) in Boulder, Colorado, had been predicting the arrival of CMEs at Earth with an accuracy of plus or minus 15 hours. They would usually say which day a storm might strike but not much more. The new forecasting system, developed by a consortium of 11 institutions led by Boston University and refined by SWPC, has been in routine operation since the beginning of the month. It includes a computer simulation that calculates how a particular CME will move out from the sun and through the evolving interplanetary “weather” on its way to Earth. One model component handles a particular CME moving from the sun’s surface into interplanetary space, and another simulates its progress in three dimensions out to Earth’s orbit and beyond. The new model components allowed SWPC forecasters to shrink their timing error from 15 hours to 6 hours. “From a space weather standpoint, that’s a pretty big deal,” says space physicist Daniel Baker of the University of Colorado, Boulder. “The forecast model gives some confidence in predictions” for the vicinity of Earth. Not that forecasts couldn’t use a lot more improvement. 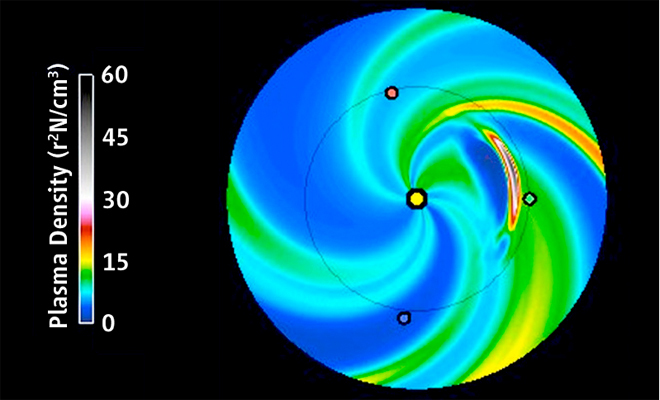 For instance, there’s no sign as yet that the advent of physics-based forecasting will improve predictions of the power of a solar storm inside Earth’s magnetic cocoon where it matters, notes forecaster Douglas Biesecker of SWPC. To anticipate that, researchers will have to understand much more about the innards of CMEs.